Think you got a pretty epic running path? Show us where you go to keep your run fresh for your chance to win big! Whether you are the distance trail runner who prefers the views of snowy capped mountains, or your the fast-paced townie who opts for skylines and city streets, we want to see what you see. Simply take a picture of your favorite view on Instagram with #RefreshYourRun, tag @FinishLine, and you have just been entered to win a pair of running shoes of your choice. Ready, set, run! We’re looking for cool locales, such as trails, cityscapes, etc. Five (5) winners will receive a pair of running shoes of their choice from finishline.com, up to $200 retail. The Finish Line Refresh Your Run Contest (“Promotion”) consists of five (5) winners (each individually a “Winner”). The Promotion begins on April 16, 2014 at 8:00 am EST and entries must be submitted by April 27, 2014 at 10:00 pm EST (the “Promotion Period”). Any entries received after such time will be void. To participate, log into your Instagram account. If you don’t already have an Instagram account, visit www.Instagram.com to create one. It is free to create an account. 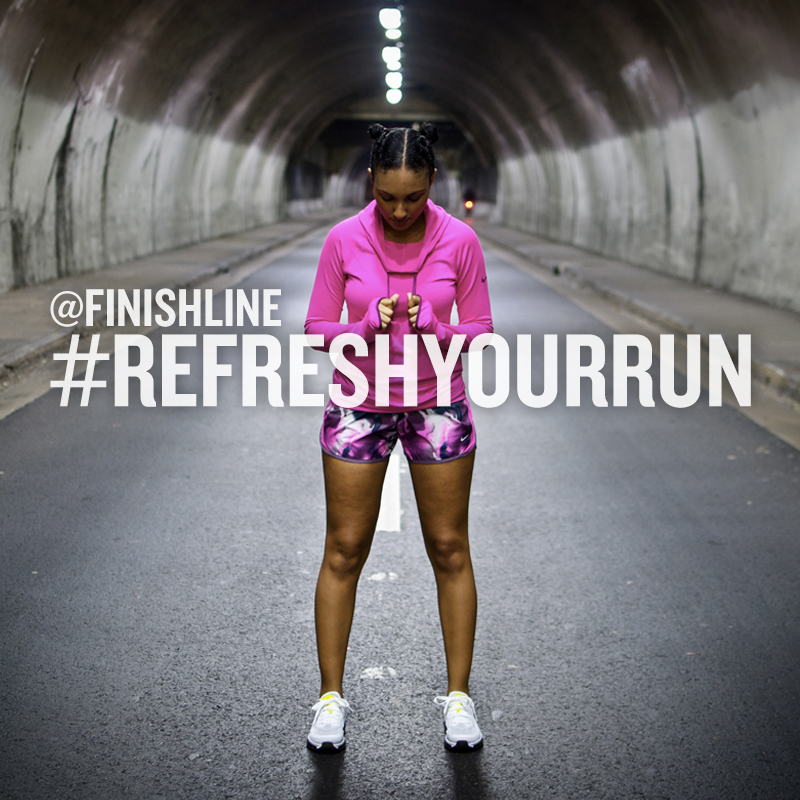 To enter, entrant must access his or her Instagram account and submit a photo of where they ran, including the hashtag #RefreshYourRun and tagging @FinishLine. Each entrant may enter one (1) time per day during the Promotion Period. Photo entry must have been taken during the Promotion Period. Any use of robotic, automatic, macro, programmed or like entry methods will void all such entries. Any attempt to do so will be void, and any entries received in excess of the entry limit are void. Promotion and Promotion Period are subject to change. No purchase necessary. Void where prohibited by law. Sponsor’s computer is the official time keeping device for this Promotion. NO PURCHASE NECESSARY TO ENTER OR WIN. A PURCHASE OF SPONSOR’S PRODUCT DOES NOT IMPROVE YOUR CHANCES OF WINNING. Each Winner will receive one (1) pair of running shoes of their choosing from a collection preselected by Sponsor; up to $200.00 retail value (each pair a “Prize”). Approximate Retail Value of each Prize: $200.00. Total Approximate Retail Value of all Prizes: $1,000.00. Prizes are not redeemable for cash. Prizes will not be replaced if lost or stolen and are the sole responsibility of the Winners. No assignment, transfer or substitution of the Prizes will be permitted except by Sponsor, who reserves the right to substitute a prize of equal or greater value. Winners may not designate someone else as the winner. If you are unable or unwilling to accept a Prize, Sponsor will award it to an alternate potential winner. Sponsor is not responsible for the inability of any Winner to accept any Prize for any reason. All expenses on the receipt and use of all Prizes, including but not limited to all federal, state, and local taxes, are the sole responsibility of the Winners. Odds of winning depend on number of total eligible entries received during the Promotion Period. Open only to legal U.S residents of the 50 United States (excluding Rhode Island) and the District of Columbia ages 13 years and older at the time of entry. Employees and immediate families (spouses, parents, siblings and children) of Sponsor and its parent, subsidiaries, affiliates and their respective directors, officers, employees and agents are not eligible to enter. Sponsor reserves the right to verify eligibility regarding the qualifications of the Winners. This Promotion is governed exclusively by the laws of the United States. You are not authorized to participate in the Sweepstakes if you are not located within the 50 United States (excluding Rhode Island) or the District of Columbia. You are eligible to win only one (1) Prize during the Promotion Period. This is a skill-based contest. All eligible photo entries will be submitted to a panel of Finish Line judges on or after April 27, 2014. That panel of Finish Line judges, whose decisions are final, will select five (5) Winners based on the criteria herein. To be eligible for judging, an entry must be an original work, cannot contain any personally identifying information and cannot have been selected as a winner in any other contest. Entries must not infringe on the copyrights, trademarks, rights of privacy, publicity or other intellectual property or other rights of any person or entity. Sponsor reserves the right, in its sole discretion, to remove photos from contest consideration if the photos contain any content that is unlawful, obscene, defamatory, libelous, threatening, pornographic, harassing, hateful, racially or ethnically offensive or encourages conduct that would be considered a criminal offense, give rise to civil liability violates any law or is otherwise inappropriate. The photos will be judged according to the following criteria: content relevant to the theme (50%), creativity (25%) and uniqueness (25%). In the event of a tie between any eligible entries, the tie will be broken by an additional judge who will judge the tied entries based on the criteria listed above. Winners will be notified via his/her Instagram account as provided to Finish Line. A representative of Finish Line will make at least one (1) attempt to notify Winners. Winners will have forty-eight (48) hours to respond and claim the Prize. If any Winner cannot be reached, or does not respond within the specified time period, or is otherwise ineligible, that Winner will be disqualified and an alternate winner may be selected. By entering, participants acknowledge compliance with these Official Rules, and all decisions of Sponsor, which are final in all matters relating to the Promotion. Neither Sponsor nor any telephone network or service providers are responsible for incorrect or inaccurate transcription of entry information, any human error, technical malfunctions, internet service response times, lost/delayed data transmission, omission, interruption, deletion, defect, line failures of any telephone network, computer equipment, software, inability to access any web site or online service, or any other error or malfunction, or for late, lost, illegible, stolen, or misdirected entries. Entry materials that have been tampered with or altered are void. This Promotion is subject to all federal, state, provincial and local laws and regulations. Sponsor reserves the right, in its sole discretion, to (i) change this Promotion in its sole discretion at any time Sponsor becomes aware of any circumstances or occurrence which would materially affect the Promotion’s security or fairness; (ii) to disqualify any claimant, competitor or nominee whose conduct is contrary to the spirit of these Official Rules or the intention of the Promotion or for any other reason Sponsor deems appropriate and to declare as void any or all of their claims or entries; or (iii) to cancel the Promotion or any part of it at any stage in the event for any reason, including circumstances beyond Sponsor’s reasonable control. Sponsor is not responsible for typographical or other errors in the offer or administration of this Promotion, including but not limited to errors in advertising, the Official Rules, the selection and announcements of winners, or the distribution of the prizes. Submitted materials become the sole property of Sponsor and will not be returned. Except where prohibited by law, all participants and Winners agree that Sponsor has the right to use the participant’s or Winner’s, as the case may be, name, likeness, voice, photograph, opinions and/or any other information, provided by the participant/Winner during the Promotion, for promotional purposes, and in any media, worldwide, including but not limited to being published on www.finishline.com, YouTube, Facebook and/or other social media sites without additional compensation or consideration. Sponsor disclaims any liability resulting from problems with this Promotion caused by any failures with the hardware, software, transmission, on-line failure or lost, delayed or corrupted data transmitted by participants. Sponsor does not accept any liability for any damage caused to a user’s computer or peripherals due to participation in this Promotion or downloading any information necessary to participate. If Sponsor determines, in its sole discretion, that there is any suspected or actual electronic tampering with the Promotion or if technical difficulties compromise the integrity of the Promotion, Sponsor reserves the right to void the entries at issue and/or terminate the Promotion and conduct a random drawing to award the prizes using all eligible entries received as of the termination date. In the event of a dispute regarding the identity of the person submitting an entry, the entry will be deemed to be submitted by the authorized account holder of the Instagram account used to enter the Promotion. Participants waive any and all claims of liability against Sponsor and their agents, affiliates, parents, subsidiaries and their respective employees, officers, directors, representatives, successors and assigns arising from any accident, injury, loss or damage of any kind resulting from participation in this Promotion or from acceptance or use of any prize awarded. Sponsor and its/their agents, affiliates, parents, subsidiaries and their respective employees, officers, directors, representatives, agents, licensees, sponsors, successors and assigns make no warranty, guaranty, or representation of any kind concerning the prizes and disclaim any implied warranty. In no event will Sponsor and its/their agents, affiliates, parents, subsidiaries and their respective employees, officers, directors, representatives, successors and assigns be responsible or liable for any damages or losses of any kind, including direct, indirect, incidental, consequential or punitive damages out of the giveaway. In case of dispute as to the identity of any entrant, entry will be declared made by the authorized account holder of the Instagram account by which the winning entry was submitted. “Authorized Account Holder” is defined as the natural person who is assigned the Instagram account in question. Any potential winner may be requested to provide Sponsor with proof that such winner is the authorized account holder of the Instagram account associated with the winning entry. Sponsor is not responsible for technical, hardware, software, telephone or other communications malfunctions, errors or failures of any kind, lost or unavailable network connections, web site, Internet, unauthorized human intervention, traffic congestion, incomplete or inaccurate capture of entry information (regardless of cause) or failed, incomplete, garbled, jumbled or delayed computer transmissions which may limit one’s ability to enter the Promotion, including any injury or damage to participant’s or any other person’s computer relating to or resulting from participating in this Promotion or downloading any materials in this Promotion. Sponsor reserves the right, in its sole discretion, to cancel, terminate, modify, extend or suspend this Promotion should (in its sole discretion) virus, bugs, non-authorized human intervention, fraud or other causes beyond its control corrupt or affect the administration, security, fairness or proper conduct of the Promotion. In such case, Sponsor may select the winner from all eligible entries received prior to and/or after (if appropriate) the action taken by Sponsor. Sponsor reserves the right, at its sole discretion, to disqualify any individual it finds, in its sole discretion, to be tampering with the entry process or the operation of the Promotion. Sponsor may prohibit an entrant from participating in the Promotion or winning a prize if, in its sole discretion, it determines that said entrant is attempting to undermine the legitimate operation of the Promotion by cheating, hacking, deception, or other unfair playing practices (including the use of automated quick entry programs) or intending to annoy, abuse, threaten or harass any other entrants or Sponsor representatives. Sponsor’s failure to enforce any term of these Official Rules shall not constitute a waiver of that provision. By their participation, participants waive all rights to trial in any action or proceeding instituted in connection with these Official Rules, including, without limitation, the Promotion. Any controversy or claim arising out of or relating to these Official Rules and/or the Promotion shall be settled by binding arbitration in accordance with the commercial arbitration rules of the American Arbitration Association. Any such controversy or claim shall be arbitrated on an individual basis, and shall not be consolidated in any arbitration with any claim or controversy of any other party. The arbitration shall be conducted in the State of Indiana, City of Indianapolis. THESE OFFICIAL RULES AND THE INTERPRETATION OF ITS TERMS SHALL BE GOVERNED BY AND CONSTRUED IN ACCORDANCE WITH THE LAWS OF THE STATE OF INDIANA WITHOUT REGARD TO ITS CONFLICTS OF LAWS RULES. For any matters which are not subject to arbitration as set forth in these Official Rules and/or in connection with the entering of any judgment on an arbitration award in connection with these Official Rules and/or the Promotion, the parties irrevocably submit and consent to the exclusive jurisdiction and venue of the state and federal courts located in or closest to the City of Indianapolis in the State of Indiana. The parties agree not to raise the defense of forum non conveniens. For the name of the Winners, please send a self-addressed, stamped envelope by May 12, 2014, to Finish Line Refresh Your Run Contest, c/o P. Hall, 3308 N. Mitthoeffer Road, Indianapolis, Indiana 46235. Sponsor’s use of your information is subject to Sponsor’s Privacy Statement at www.finishline.com. The Finish Line USA, Inc. This Promotion is in no way sponsored, endorsed or administrated by, or associated with, Instagram.